As the solar industry continues to grow, you are beginning to strongly consider the switch to clean energy. Since solar installation is a big decision, it should not be taken lightly. You obviously want to know exactly why you should go solar and how it will benefit you and the environment. Hopefully this list of ten reasons you need to go solar will convince you that solar is indeed the right choice and a very wise investment. By installing solar you are becoming part of a national (and global) effort to reduce the amount of gas, oil, and coal used for energy consumption. Unlike fossil fuels, solar energy produces no harmful emissions that damage the environment. A movement toward solar and other clean energy is movement toward a healthier planet for us and future generations. Having a solar unit installed on your home will typically increase your home’s value. With the growth of the solar industry, it has become common for appraisers to take solar units into account when determining the value of a home. A study from UC Berkeley has found that homes with solar installed in California sold for $17,000 more than comparable homes without solar panels. Unfortunately, utility companies keep on raising electricity prices. You never know when the next bump up in price is going to be. If you choose to install solar, your energy costs will be much more predictable. You will pay the same monthly rate until you pay off your unit. This makes budgeting a lot more simple. Solar is now affordable for almost everyone. OSullivan Green Solar offers a variety of financing options designed to fit any budget. Additionally, many states and regions offer tax credits and grants in order to encourage homeowners to start living off of clean energy. The installation of solar will drastically reduce or even eliminate your electric bill. It is very possible that your solar panels will produce all of the energy you need to sustain your daily routine. However, even if you do not produce quite enough energy, your energy bill will be a shadow of what it once was. Are you worried that you will have to constantly pay someone to come out and fix your solar unit? Don’t be. Today’s solar panels are extremely durable and are built to last in almost any weather condition. Since solar units have no moving parts they require very little maintenance to keep working at maximum efficiency. Solar panels are known to last up to 25 years working at maximum capacity with regular maintenance. Most solar panels only require a wash with soap and water now and then. Many solar units continue to survive past the 25 year mark while operating at less than 100% efficiency. The service of your solar unit can be stretched to 40 years with the right care. That means that your unit will keep producing energy long after you have paid it off. There is a huge misconception out there that implies that solar energy can only be used when the sun is out. This is ludicrous! Just because it is nighttime or the sun is covered up by rain clouds does not mean that you will not be able to use solar energy. Solar energy that you do not use when the sun is out is stored for later use. Wouldn’t it be awesome if PG&E paid you for energy? This may sound too good to be true, but it isn’t! 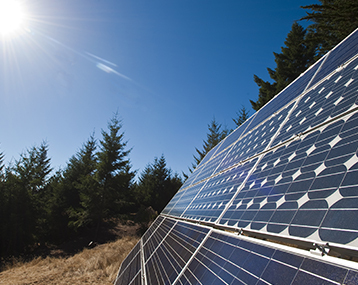 If your solar unit produces more energy than you use in a given month, PG&E will credit you for the surplus energy. So not only will producing solar energy save you money that you would be paying PG&E, the utility company may actually end up paying you! The more frugal you are with your energy, the more money you can earn. Solar and renewable energy is the way of the future, but there is still work to be done. By installing solar, you are not only saving money, you are saying that you are ready to do your part to care for the environment. When your neighbors see your solar unit and how easy it is to maintain, they will start to question why they haven’t had one installed themselves. Are you convinced yet? The time to go solar is now. If you have any questions regarding solar installation for your home, contact the experts at OSullivan Green Solar.